I have a serious crush on a particular pizza. It’s the Italian Combo thin crust pizza at Little Star Pizza that has salami, pepperoni, sliced onions, sliced bell peppers, black olives, and pepperoncini strewn across its crackly surface. For me, it’s the combination of salty cured meat with the vinegary, spicy pepperoncini that really does it. It’s the stuff of cravings. Since I have it in my powers to make a pretty mean pizza myself, (good sourdough starter, blazing hot oven, pizza stone, some culinary skill) there’s no reason to drive across the bridge for pizza. Especially since we have the best pizza on the planet (in my opinion) right here in the neighborhood at Pizzaiolo (if only I knew the secret to their crust). Not to mention, pizza is incredibly cheap to make, but not so incredibly cheap to buy. I’ve posted my pizza recipe before here, but I’ve since realized that there’s not enough water in that recipe. Maybe my starter was wetter when I wrote it or something, but I find a moister dough makes a thinner, more tender, and more bubbly pizza. So here’s the recipe again with more water. As for the toppings. 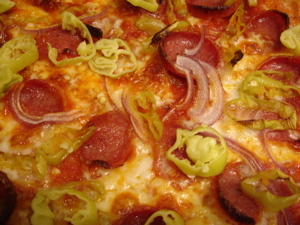 I don’t really like bell peppers, don’t think the pizza needs the black olives and the pepperoni, so the pictures depict my simplified version with salami, onions, and pepperoncini. I really recommend investing in both the peel and stone. I don’t like keeping a lot of specialized kitchen equipment around so I tried for years to make do. I never managed to make good pizza until I invested in the proper tools. Don't get discouraged if your pizza isn't great out of the gate. Pizza making is a craft. Like any craft, practice improves the results. It will always be edible and it's fun, so enjoy the process and don't get too hung up on perfection. As they say in Guatemala: Poco a Poco. Preheat oven and pizza stone to 550 degrees F.
Mix together the yeast and 1 tablespoon warm water until yeast is dissolved. Add starter, flour, salt, and olive oil, and start to mix. Add water until the dough is pliable but not sticky. Continue to mix. Flour your hands and knead in the bowl for a few minutes until blended. The dough will be quite sticky. Cover the bowl and put in a warm place and let rise for 3 to 5 hours. Punch down and divide into 2 balls. Flour a flat surface generously and lay the balls down, flattening them slightly with your hands. Dust the tops with more flour. Let rest for 10 minutes. Stretch out to desired thinness and place on a cornmeal covered pizza peel. Top as desired. Bake until brown and crisp, about 10 minutes.